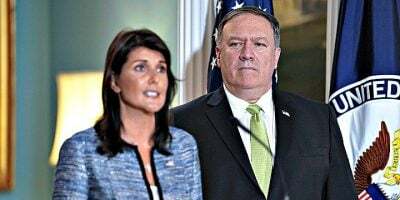 The US obviously does not intend to negotiate with North Korea, it intends to dictate to North Korea, and pressures the UN Security Council to further the strangulation of the DPRK by halting all additional oil shipments to North Korea. Fortunately, at last, China and Russia blocked this aggression by the US, stating they need more information. Haley stated she had “photographs of proof” of 89 ship-to-ship transfers of oil in violation of the sanctions. Haley’s “photographs” are reminiscent of Colin Powell’s fraudulent photographs of Iraq’s weapons of mass destruction, which he displayed before the UN Security Council, and which were later exposed as fabrications. The US failure to agree to a peace treaty is a venal posture perpetuating the recent crisis situation. One must ask why the US is refusing to sign a peace treaty, and the refusal suggests an intention, at some point, near or in the future, to resume to monstrous war inflicted on North Korea and China from 1950-1953. In 1950 the US attacked North Korea before a UN resolution was passed authorizing the attack. John H. Kim, a US Army veteran and the Chair of the Korea Committee of Veterans for Peace, stated that during the Korean War “the U.S. Army, Air Force and Navy were directly involved in the killing of about three million civilians at many locations throughout Korea,” and predominantly in the North. The US dropped almost one million tons of bombs, and more than 50,000 tons of napalm on North Korea. In addition to the massacre of millions of North Koreans, more than one million Chinese were killed by US-UN armed forces. The US-UN forces used biological warfare against both North Korea and China, and both North Korea and China were threatened with annihilation by atomic bombs. Almost identical nefarious tactics are currently being used to pressure the Security Council to support the multiple sanctions resolutions against the DPRK, sanctions which demonstrably constitute crimes against humanity. It seems that nothing has changed during the 68 years since Andrei Gromyko exposed the Machiavellian methods by which the US obtained “authorization” for the war crimes committed against North Korea. Featured image is from The Algemeiner.